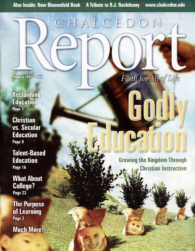 It is a deadly error on the part of the Christian school to assume that its task is similar to that of the "public" or government schools with the Bible added to it. There are no common sets of facts that are shared by both Christians and non-Christians. If we simply reproduce the same facts, we reproduce the same religion of humanism as that of the state schools. My father, R.J. Rushdoony, frequently noted that culture was religion externalized; it was the outworking of religious faith. In terms of this we can also note that education is training in terms of a culture's religious faith. When I first met Dr. Rousas John Rushdoony, I was in awe of his great wealth of knowledge and wisdom, and the way he articulated both in such a non-condescending way. Rousas John Rushdoony is widely known as a writer and theologian, not as a gladiator. Yet a gladiator he was, and his arena was the courtroom in a multitude of lawsuits in many states. Government Schools: Producing What We Pay For! There is hardly a political discussion these days that does not in some way involve education. Most surveys show that voters are concerned about giving America's children a good education, and today's educational-industrial complex insists that money should be no object. In a society with a now largely effaced Christian heritage, virtually every area of human activity requires rethinking to establish a sound Biblical view. Student evaluation and grading is not the least element of education requiring a theological treatment. As Christians in an increasingly complex world, we recognize the crucial role that higher education plays in preparing us for our calling in God's plan of dominion. For most people, higher education necessarily means at least a four-year degree from an accredited college. The war is over, and they have won. This is the background for James Clavell's short masterpiece, The Children's Story. The story is set in a second grade classroom somewhere in America. It begins at two minutes to nine as the children discover they have a new teacher. It's not unusual to look for positive feedback when we're involved in a consuming commitment. Rewards along the way can confirm that we are headed in the right direction. He was a normal boy, who liked work as little as a colt likes the cart. Unaware of his own latent powers, he did as other boys in Hanover were doing — went barefoot in summer, fished, swam, sang, fought, did "chores," and in fall and winter roamed the forests with his flintlock. Oriana Fallaci, the intrepid Italian journalist, known for her no-holds-barred interviews of world leaders and celebrities, has written a book that the Moslems in Europe have tried to ban.